Thank you for joining me as we count down to the MFT release. We are four days away from the big day! All the new Stamps and Die-namics will be available on Tuesday, December 5 at 9:00 pm EDT. Be sure to check out the MFT Blog to see all the new items being revealed today. Don't forget to leave a comment on the MFT Blog countdown posts, YOU could win one of the five $75.00 gift vouchers. I have a floral sympathy card to share with you today. I always try to have a few sympathy cards on hand for those unfortunate times that I need one. I used the gorgeous Painted Flowers stamp set to stamp the flowers. This is a multistep stamp set, where you create dimension with layers of ink. The sentiment is from the Deepest Sympathy stamp set. I stamped it on a Smooth White cards tock that was die-cut with the Stitched Tag-Corner Rectangle STAX Die-namics. I stamped the background with the Distressed Patterns stamp set. It's very subtle, but I like the extra texture it adds to the card. 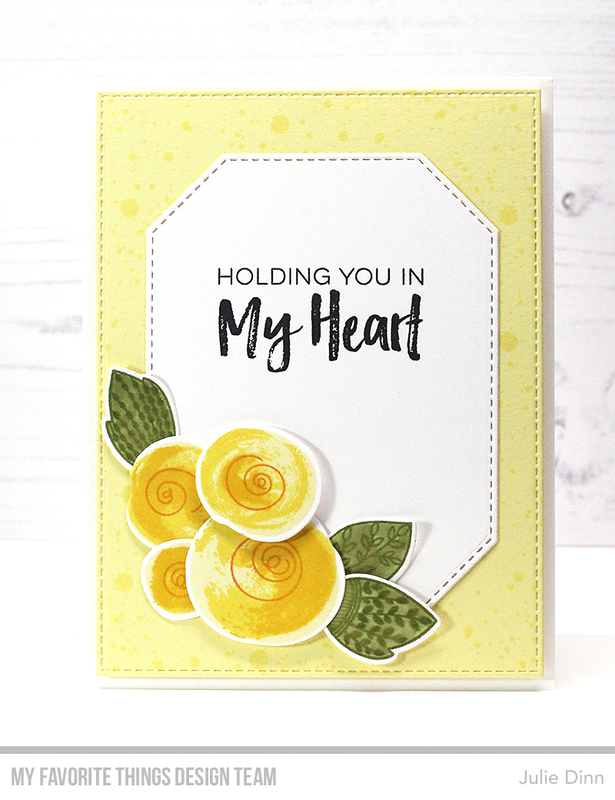 Love your use of the new Stitched STAX Die-namics, which accents your lovely flowers perfectly! Simply said - such a pretty card! Very pretty!Thank you for sharing!